NWT ~ Set of 4 Godinger Dublin Beverage Stemware. Clear Thick Lead Crystal Goblet. Shannon Designs of Ireland. This set of crystal wine goblets is in the Godinger Dublin pattern. Wine - Water - Champagne. Shannon Crystal Designs of Ireland. More likely used for water rather than wine. Made in Czech Republic. Shannon Crystal Designs of Ireland. These glasses, weigh 7.5 oz each and are probably lead crystal. · These heavy hand crafted crystal glasses are in excellent condition. I have 2 sets of these glasses available (8 total glasses). This is a very attractive piece made of lead crystal and can be used as a candle holder or vase. Nice addition to any décor. The piece is in excellent condition with the exception of 1 small scratch on the inside of the glass. 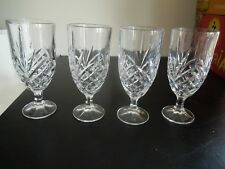 You are looking at (6) six I believe Godinger Dublin Shannon Crystal Old Fashion Footed Glasses. They are approx. New Listing2 - Shannon By Godinger Crystal South Beach Palm Tree Candle Holder Vase 7 1/2"
One Pair of Shannon By Godinger Cut Crystal South Beach Palm Tree Candle Holder Vase. Doing my best to make it in this world. Now, in my early fifties, I feel almost retired. Even though E-bay is a lot of work. These beautiful, substantial glasses are in superb condition with no chips, cracks, or scratches. 6 5/8” tall by 3 1/8 base diameter. Open box, that originally included 8 glasses, includes 3 old fashioned glasses, 11 oz, and 4 crystal highball glasses, 12 oz. Shannon Crystal Goblets Iced Tea Water All Purpose Goblets Set of 4. With labels - 1 missing front/green portion of label. Excellent conditon. Shannon Crystal By Godinger. Coordinates with extensive Godinger Dublin serve ware and accessories. From the Dublin collection. et with 6 wine glasses. Classic Irish design combines sparkling wedge and diamond cuts. Beautiful glasses! Made in Poland. Get Supersized Images & Free Image Hosting. Pictures are of actual item for sale. Shannon Crystal Martini Glasses - set of 4. This is a gorgeous set. Crystal Clear and in Excellent condition. Perfect gift idea, or addition to your own bar. Many still have the sticker on the base. Each weighs 14.3 ounces. Shannon Crystal By Godinger. Coordinates with extensive Godinger Dublin serve ware and accessories. From the Dublin collection. et with 6 matching wine glasses. Classic Irish design combines sparkling wedge and diamond cuts. This is an elegant pair of crystal wine glasses the pattern is King Louis made by Shannon -Godinger. Shannon 2 Crystal wine glasses 6-1/2"
Wine glass. These glasses weigh 7.2 oz each and are probably lead crystal. They might be Shannon Irish crystal Dublin pattern but I don't think so. They do look very similar to that. My interest is that you receive a quality product in good shape. This is a used item so condition issues may be present but in very good shape.